Enjoy traveling? Planning a vacation? Dreaming of getting away? Whether you’ve traveled recently or a few years ago, you’re probably familiar with hotel services. Travelers typically leave their hotel room and when they return their room is completely refreshed with new towels, sheets and, if lucky, sometimes there are chocolates on the pillow. These hotel services, however, have started to change. Over recent years, the green energy movement has picked up steam. Many people have changed simple things about their daily routines such as carpooling, composting leftovers or even letting their hair air dry to minimize their carbon footprint, reduce waste, conserve energy and overall benefit the environment. As a result of this movement, some hotels are transforming their operations to include eco-friendly practices. The hospitality industry is huge and can include all things related to tourism but let’s just focus on hotels. Hotels are everywhere. Think about how many hotels are within the radius of your city, and then your state. According to the American Hotel and Lodging Association (AH&LA), in 2013 there were approximately 52,000 hotel and lodging properties in America with more than 15 rooms. That equates to almost 5 million guest rooms for travelers. Can you even imagine how many hotels and similar lodgings there are around the world? Since this industry is so large, the slightest of changes could have a major impact. The U.S. Green Buildings Council suggests that hotels spend approximately $4 billion in energy annually. Therefore, if hotels implemented eco-friendly practices they could be instrumental in changing energy consumption, water usage and waste diversion and potentially cut energy costs. For example, according to Energy Star, a Marriott in Michigan changed to CFLs and saved an upward of $40,000 in maintenance and energy costs. Many hotels have already joined the green movement. The AH&LA suggests that environmental awareness within the industry exploded in 2005. 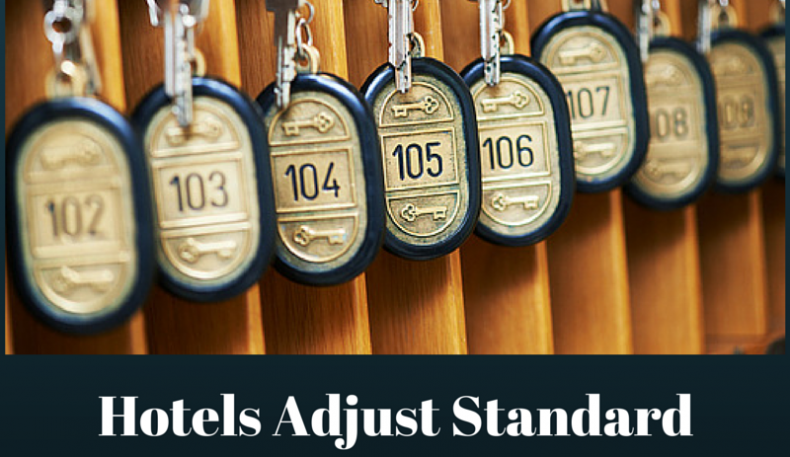 Avid travelers may have noticed the changes in hotel operations since then. Although hotels implement different practices to reduce environmental impact, many practices are shared across hotels. #1) Housekeeping cuts towel exchange. At many hotels, housekeeping no longer exchanges your towels for clean ones automatically. Unless you ask or place the towels in the designated area for rotating, you’ll probably shower with the same towel night after night. By limiting towel replacements, hotels are reducing energy and water consumption. #2) Limited control of thermostat. Air conditioning in a hotel in the United States is expected, however, if you travel abroad it’s often viewed as a luxury. If your hotel offers AC and is energy-conscious it’s likely they have an energy management system in place to regulate individual room temperatures. This prevents guests from increasing or decreasing their room temperature too much. #3) Low-flow showerheads and faucets. Hotels often use low-flow showerheads and faucets to conserve water. In comparison to standard showerheads your water pressure seems low but that’s because standard showerheads use 2.5 gallons of water per minute whereas low-flow showerheads use 2.0 gpm. According to the United States Environmental Protection Agency, the average family could conserve almost 3,000 gallons of water per year by installing water efficient showerheads. Energy Star reported that Loews Hotels implemented energy savings projects such as upgrading showerheads and toilets, which led to a 50% decrease in water flow rate. #4) Cold pools. If you’ve ever attempted to go into your hotel pool early in the morning it’s likely you’ve thought it was too cold. That’s probably because many hotels lower pool temperatures when the pool isn’t in use, such as overnight. The EPA encourages hospitality businesses to manage their pools and spas as another way to go green. #5) Newspapers only available in lobby. Print newspapers used to be distributed to each hotel room for guests to catch up on current events. Many hotels have changed this practice and now only offer print newspapers in common areas such as the lobby for guests to share. This helps hotels cut back on waste. By incorporating eco-friendly principles, hotels are attempting to reduce energy, water and waste and offer travelers a more environmentally friendly habitat. Now many hotels offer more than just clean sheets. They offer solutions for a cleaner environment.